I make no apology when I say I dislike houses that have been named by joining family Christian names, like Alary, Stirena, Donally, Fioneve, Suvin need I go on. You may wonder where this is going? When we bought the land we bought it as a company. Without going into too much depth we did it this way on the suggestion of our solicitor. Because Brendan and I aren’t married and because he has children the inheritance laws are complicated. The notaire explained ‘If mister dies you missus have a life interest in the company and if missus dies you mister have a life interest in the company’. I came out totally befuddled and none the wiser, all I did know is that madam and monsieur does not sound as sophisticated when translated as mister and missus. Anyway, to form the company we needed a company name. We pondered over this and finally came up with Chez Brenorah! Can you believe that, we did it, we actually took Brendan and Deborah and came up with Brenorah! Quell horreur! We have a bank account in the name of Chez Brenorah, every bill has to be addressed to Chez Brenorah and now I have to live with this until the day we sell the house! The Little Geordie Builder is suffering! His back is bad, but he is a martyr to the cause and is carrying on building albeit more slowly than he would like. My efforts to get him to the kinesiotherapist (I still can’t say that word) have fallen on deaf ears. Despite this the building is up 5 courses, the door and window openings are visible and I now get a good feel for the size of the house. The main house will of course be divided into rooms but the kitchen/family room is just the one room and is looking a good size. The view from my kitchen. We visualise the house very differently. Brendan sees the finished house as empty rooms with just plastered walls. I on the other hand see it furnished, including curtains, cushions and pictures! Having said that I still can’t decide where to put the fridge, hob or oven, although some electric conduit has already gone in on the day of concreting when I had to make split second decisions and say ‘there, there and there’. However, if I flutter my eyelashes and make a nice apple crumble I am sure I can get the LGB to put more wires in later! Sadly, we won’t be playing croquet on the lawn this weekend. It is hard to imagine this sodden muddy heap ever being a lawn. The digger was slipping and sliding and not holding the wet ground well at all. We have spent a couple of days putting up scaffolding and loading it with blocks. We collected the stone window sills. Getting them off the truck with the digger was a little fraught, me panicking that Brendan was going to bash and crack them and him moaning at me panicking! Job done, no casualties. As well as preparing the site for building we cut a load of logs for the fire. Log fires are lovely and cosy but there is something to be said for flicking a heating switch on when you get in at night. Not to mention the times we have been out in the freezing snow cutting, chopping and stacking logs. Perversely there is something satisfying in doing this chore. Brendan of course loves it. I don’t love it when he stands on the pile cutting the logs with the chainsaw in his slippers! After another sleepless and painful night Brendan went to see Monsieur Le Colin the kinesiotherapist. He saw him a couple of years ago and before he went this time the brave LGB said he would walk out of the surgery if Monsieur Le Colin used ‘that hook thing’ again. Lo and behold out came the ‘hook thing’ or crochet as Monsieur Le Colin called it. As Brendan was in just his underpants there was no chance of a hasty escape. He was in agony. I have to admit it did look like an instrument of torture. It must have hurt because it left red welts all along his back. After having his leg manipulated into the most awkward position, Mr Le C clicked four vertebrae back into position and the LGB walked out a new man! He spent the rest of the evening telling me how marvellous he felt and how easy it was to bend down, take his trousers off, put his socks on, do the can-can. He has to take it easy for a couple of days, but is saying he can’t wait for Monday! 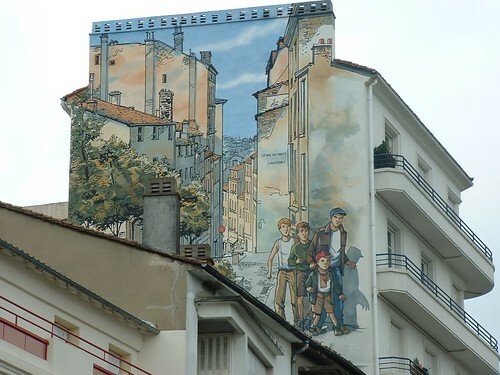 There are many buildings in Angouleme decorated with this fantastic street art, however I don't think it will be adorning any of our walls. I'll paint your walls if you DO want any!!!!! thanks for taking part in my give away! Love what you wrote! Hope Brendans better. See you soon! hx ps! magnus is wondering where you are We haven't seen them for ages he's saying! I love reading your blog. Glad that Brendan's back is on the mend. Hey - you were in the UK and didn't let me kno! - naughty! I would have gone up to your dad's house to see you. I'd love to give you a hand with the build this summer. No specific skills, just general labouring. I helped my dad build my garage in Ireland - the only labouring on my CV I'm afriad. What I lack in experience, I make up for in enthusiasm. Deb - I'll send you an e-mail with all my news. I'm going to be a grand mother soon - Darcy's girlfriend Charleigh is expecting my first grand daughter - how exciting is that - dancing granny eh?